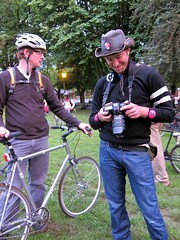 It’s also a celebration of the next step in Portland Afoot’s journey: We’re planning to team up with BikePortland.org. 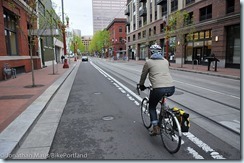 You can read about this on BikePortland, too. Portland Afoot has worked with BikePortland, the region’s indispensable source of bicycle information and inspiration and one of the best local news startups in the country, since before we even launched. Jonathan, BikePortland’s founder and editor, has been a guiding light, a collaborator and often a mentor – never hesitating to welcome Portland Afoot’s voice to the public conversation with as much care as he welcomes every other. Though Jonathan and his wife Juli operate BikePortland as a mom-n-pop media business and Portland Afoot is published by a small 501(c)3 nonprofit, I think both enterprises prove that social entrepreneurship is as social entrepreneurship does. A year ago January, in Portland Afoot’s annual report to the community, I wrote that Portland Afoot had achieved too many successes to abandon, but not enough success to survive without changing. Today, with 2,100 subscribers to our monthly, about 800 podcast regulars, 11,000 unique web visitors a month and $18,000 in revenue last year, that’s still the case. At the time, I identified four possible roads: doubling down on our monthly, shifting to quarterly publication, going online-only and merging with another organization. In the months that followed, we launched a successful Kickstarter campaign that allows us to continue putting out a magazine-style product – one that’s free on mobile devices, unconstrained by the rules, structures and marginal costs of print and mail. Tomorrow’s game is the culmination of seven months of work developing the software for that mobile edition – which will also be open-source and available to small publishers everywhere. Now, Jonathan and I are going to start collaborating more closely. We’re not quite sure yet where we’re going, which channels we’ll use or what sort of news operation will result – but we’re sure that working closely together is the best way to make both organizations better. We’re also sure that we want your advice. BikePortland and Portland Afoot exist only because of the amazing communities of Portlanders who are passionate about low-car life – people who take interest in our work, discuss it and (most importantly) do all the amazing things that we write about. If you have ideas about how our collaboration can support that community even more, we want to hear them. We might ask you personally for advice, too. This collaboration means that we’re going to end some things that haven’t worked, which will let us continue to do things that have worked while creating new things that we think will work. If all goes well, this will mean we’ll be creating new types of information. And to use another word that has defined BikePortland’s mission since 2005: If all goes well, this partnership will also be creating a new type of inspiration. We’re very glad you’ll be here to keep inspiring us, too. Commuter photo by Jonathan Maus/BikePortland. Post by michael at 12:00 pm May 3rd, 2013. Like what you see? Get future posts by email.